Now, there are some foods that are… decidedly regional. Pinto beans and cornbread are one of those–what my mother labels “hillbilly food” and Dad considers to be serious comfort food. It’s food you eat when you’re cold and hungry, times are lean, or you just need a Proustian moment. Now, the cornbread must be cooked in a cast iron skillet, but modern cookware is fine for the pinto beans. Cornbread controversies wreck marriages, so I say make it the way your mother did. Sweetened, unsweetened, all corn, corn plus flour, bacon fat, oil, butter; what truly matters is that you use that hot cast iron skillet. Personally, I’m okay with a little sugar but not with cake disguised as bread. If you don’t have a recipe, try this one. 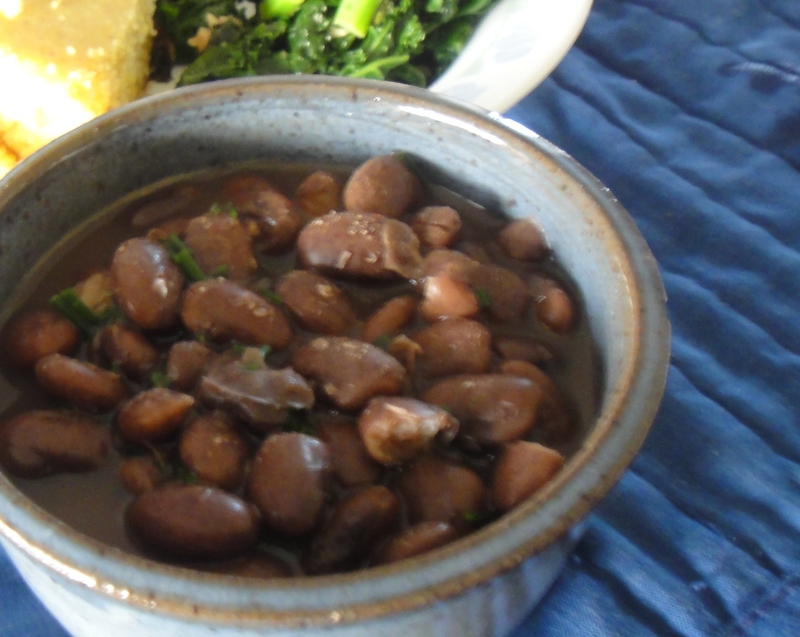 Pinto beans, at their most basic, can just be a pot of dried beans cooked until soft. Traditionally, you might add a little fat of some sort (we’re talking about cooks who make did, so you do the same) and a bit of salt and pepper. Actual pork or a ham bone might be used if it could be spared. Just as there are sweet cornbread people, there are non-onion eaters. I’m in the onion camp. By all means, top those beans off with a touch of chopped raw onion or sliced green onions. In the vein of making do when there were no onions recently, I used a handful of wild garlic greens from the yard, along with a touch of smoked paprika, in our last pot. The paprika keeps the fats healthy while adding some serious flavor. I only seasoned a portion of the pot, and reserved the rest for future meals. Add the beans, their liquid, the oil, and the paprika to a saucepan. Heat, stirring occasionally, over medium heat. Meanwhile, pick through the garlic greens and remove any grass, weeds, or other undesireables. Wash, and chop finely. Once the pinto beans have come to a boil, reduce the heat and cook for 5-10 minutes. Add the garlic, stir well, and serve promptly. Serve over or beside cornbread. This was my every night meal during graduate school done in the slow cooker. I love it. Glad to inspire happy memories!